As a person interested in preserving the Architectural and Cultural Heritage of Linden, great presentations are lined up for you at Preservation Texas’ 2018 East Texas Regional Meeting in Nacogdoches! For more information including registration and Summit schedule, and the line-up of speakers and tours focusing on small town heritage issues, see http://www.preservationtexas.org/etxmeeting/. It is a relatively short drive to Nacogdoches and well worth your time to learn from the experts on a range of preservation issues relevant to ongoing efforts of the Linden Heritage Foundation http://lindenheritage.org/. Full registration for the three-day event is just $100 for members and $125 for prospective new members (includes a one-year personal membership). Day passes for the tour on August 8th ($60/$75) and the educational sessions on August 9th ($50/$65) are available as well. Register online at https://pt.z2systems.com/np/clients/pt/eventRegistration.jsp?event=631& . 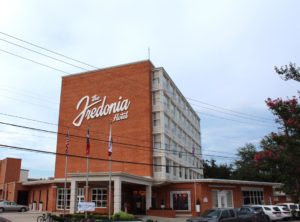 Participants are invited to stay at the recently rehabilitated Fredonia Hotel in Nacogdoches, a midcentury modern landmark in downtown Nacogdoches located within walking distance of all venues, where a reduced room rate of $109 is available. Reservations can be made by calling the hotel at 936-564-1234. Note that the tours on August 8th and August 10th will begin and end at the Fredonia Hotel.